Lamejoun hot out of the oven! Last Friday my dear husband and I decided that it was time to make Lahmejoun. My wondeful Armenian friends know what this entails, lots of work! 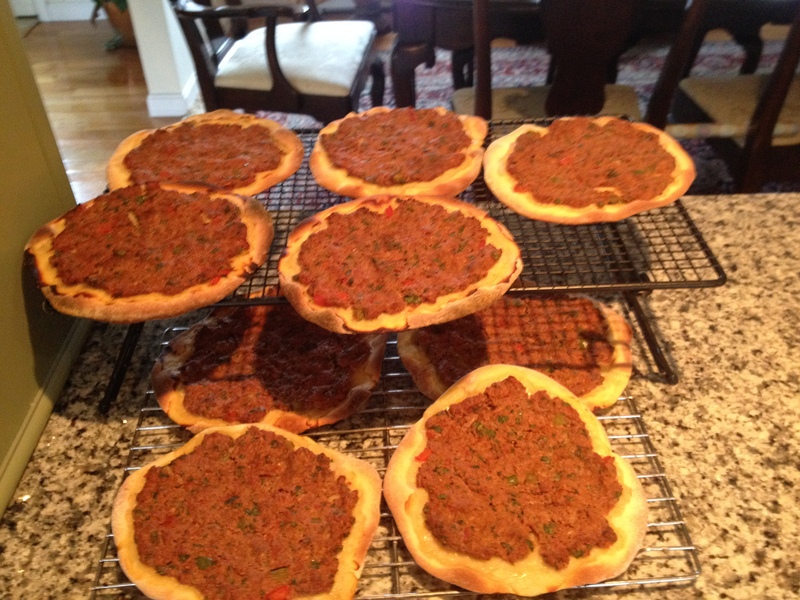 For my non-Armenian friends, Lahmejoun is an Armenian meat pie, probably unlike anything you have ever eaten before. They are the best addition to any meal, or a meal by itself. So Friday we went to the market and bought 8 lbs. of ground lamb, bell peppers, garlic, lots of parsley, crushed tomatoes, flour and yeast. For two and a half hours I cleaned, cut and diced veggies. Then I added all of that and some wonderful spices to 8 lbs. of ground lamb. Needless to say you need a very large bowl to mix all of those ingredients. That all went into the fridge to wait til morning. The next morning I mixed 2 packets of yeast with lots and lots of flour. I think at this point it was about 6 lbs. of flour. To say that my arms were getting a bit tired is an understatement. The fun hadn’t even started yet! I let the dough rise for about 1 1/2 hours. While the dough was rising I continued to chop veggies and made a pot of Minestrone Soup. My mother-in-law Irma taught me how to make Lamejoun and whenever we made it together we also made a pot of soup to go with it. Irma was not Armenian, she was French Canadian and Irish, she was a hell of a good cook and she happily taught me everything she knew about Armenian food. We always had fun when we cooked together. I have 2 beautiful ovens, both were set at 500 degrees. Thankfully it was a dreary, rainy cool day so having the ovens on that high was not unpleasant. To make Lamejoun you need to roll out the dough into a thin round disc about 7-8″ in diameter. Then you add about 1/3 cup of the meat mixture. I use parchment paper on the cookie sheets so that I don’t have to wash them between batches. Cooking them is a 2 step process. First they go on the bottom of the oven for about 8 minutes then they are moved to the top rack for an additional 6-8 minutes. This is where Chuck steps in. 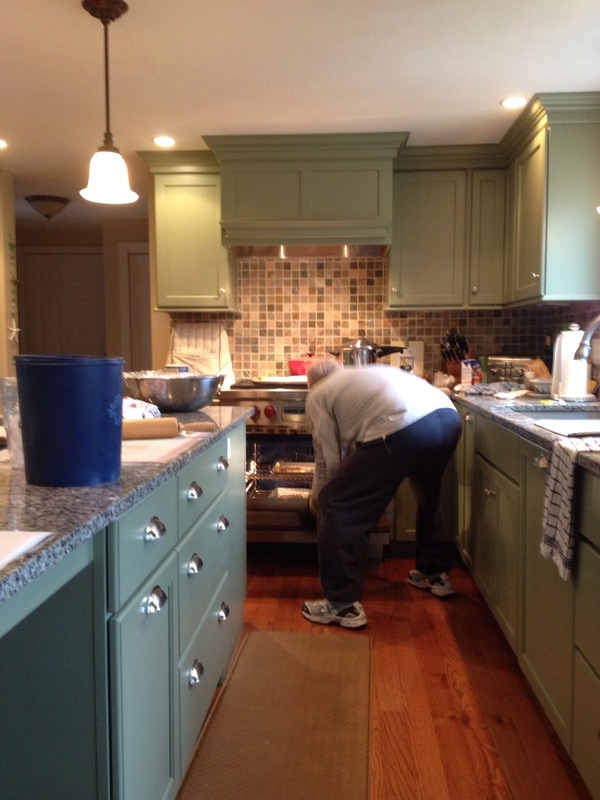 While I am rolling out the dough, he is watching the oven and counting the fruits of our labor. The first 2 Lamejoun that come out of the oven go right into our mouths. Oh my goodness! it is sooo good hot out of the oven. We worked together for a couple of hours, until we had 6 dozen Lamejoun baked. Trust me we were tired. It is a lot of work but the end result is so wonderful. 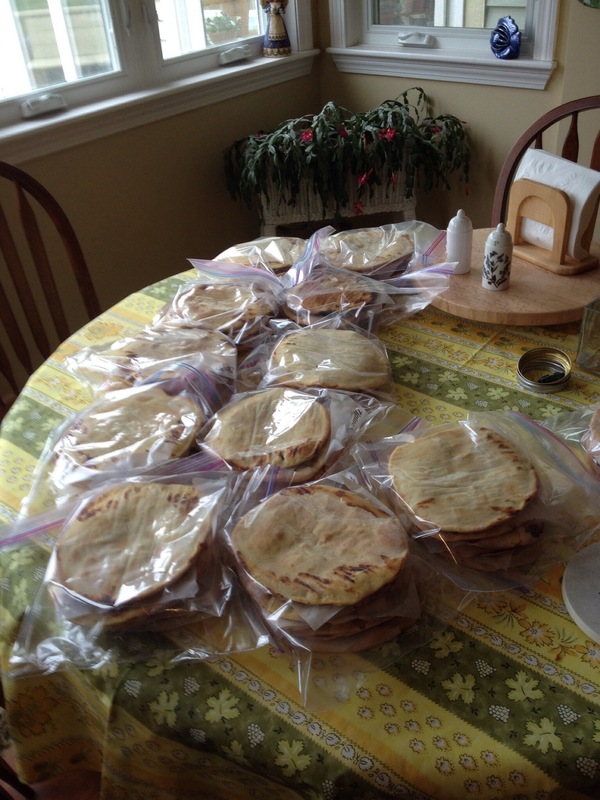 We can go to the markets in Boston and buy Lamejoun but I have to say there is nothing like homemade. At this point we have 5 dozen Lamejoun in the freezer – we will deliver some to various family members over the next couple of weeks. If it is a dreary Spring I will make more – they are a great dinner when you are busy and don’t feel like cooking. Chuck and I had a great day cooking together. I don’t know how my dear Mother-in-law ever made 100 of these by herself – she was quite a lady! Now back to my quilting. ← Wow – I haven’t posted anything in a long time…. I enjoyed reading this so much!! Sounds like you and Chuck had a great day in the kitchen. We did, and the rewards for our hard work was good food in the freezer!